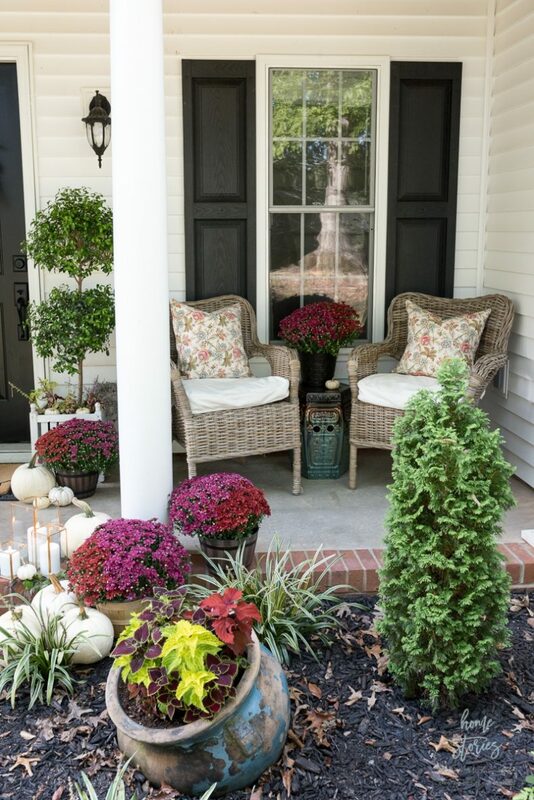 Create a cozy fall porch using plum and red mums with gold lanterns and floral toss pillows. 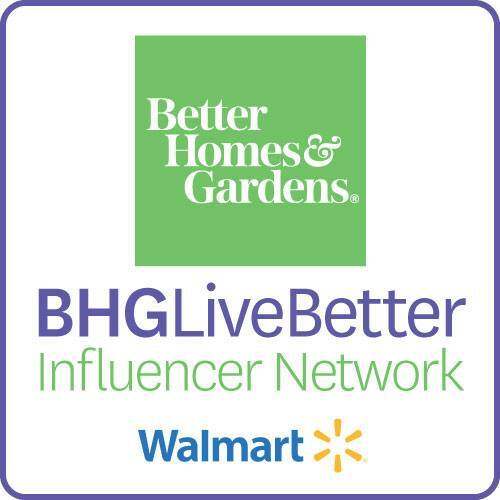 I am part of the Better Homes & Gardens for Walmart Influencer Network, and each month I receive a challenge to decorate a part of my home using Better Homes & Gardens for Walmart products! 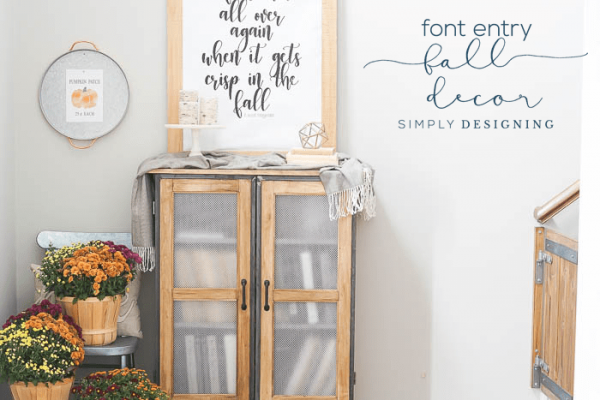 It’s a joy for me to show you how to get a high-end look using adorable and affordable pieces. 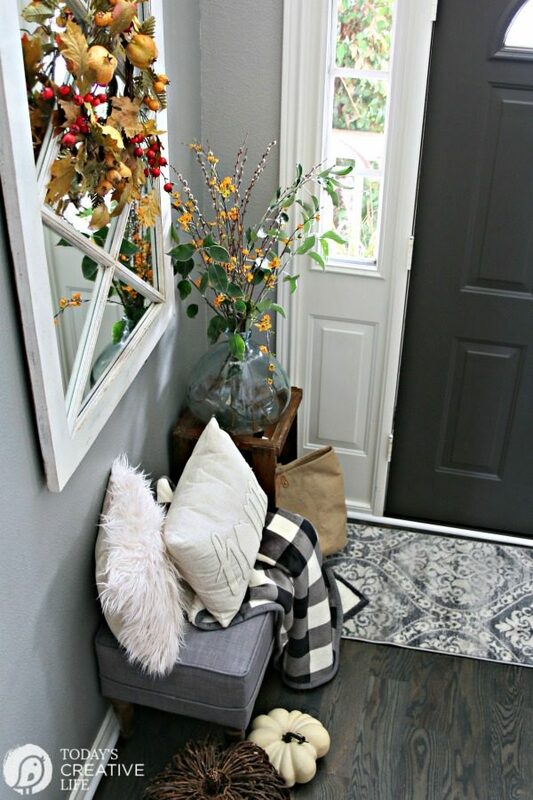 This month’s challenge is to decorate our home’s entryway and I am always up for that challenge! 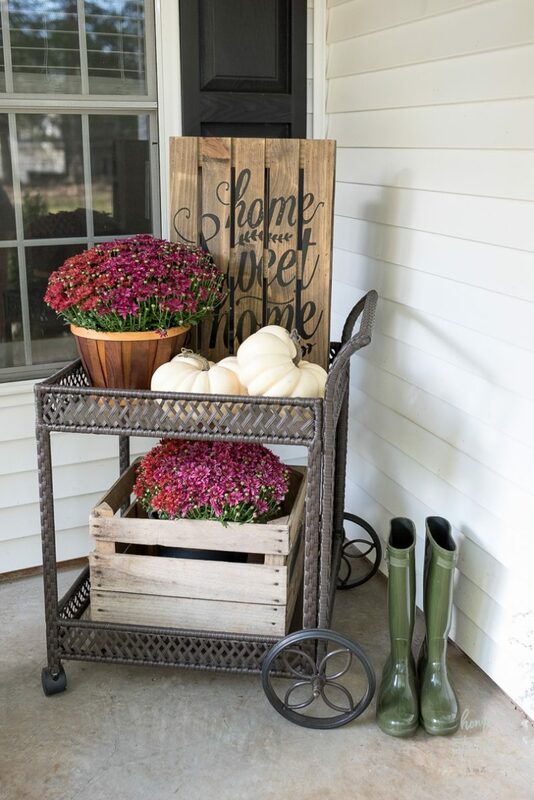 If you’ve been a long-time reader here at Home Stories A to Z, then you know that decorating a fall porch is one of my favorite spaces to decorate! 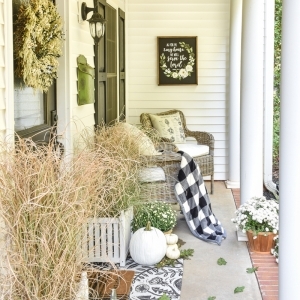 Click here to see some of my porches that have been featured in magazines. 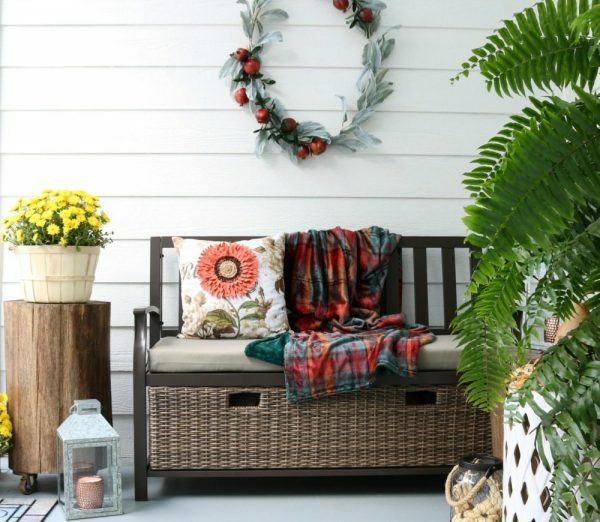 I didn’t have a plan or color-scheme for this year’s porch so began browsing on Walmart.com to see which Better Homes & Gardens products inspired me. 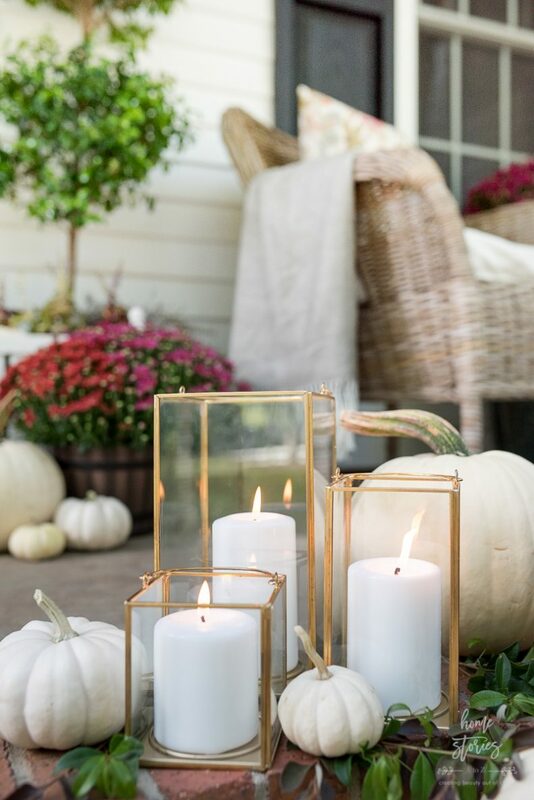 These gorgeous and simple gold lanterns in three different sizes immediately caught my eye. 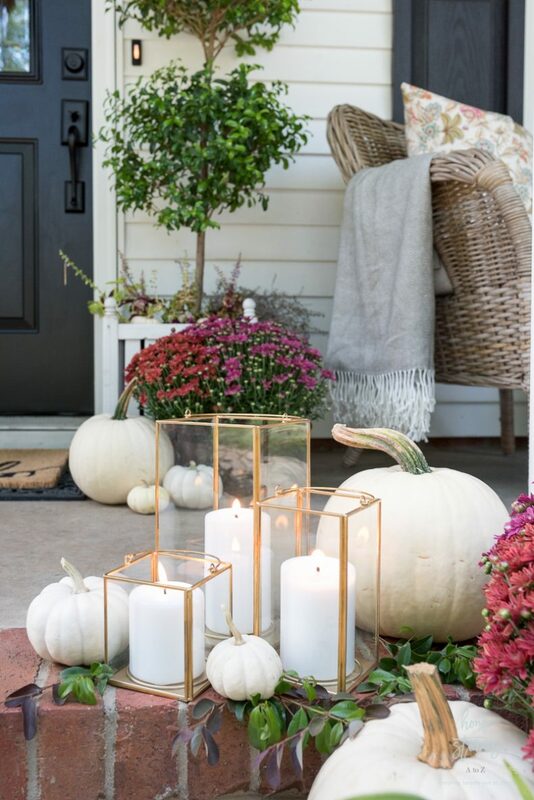 Their beauty and simplicity makes them perfect to use year round and I love how they add a touch of elegance to the porch! 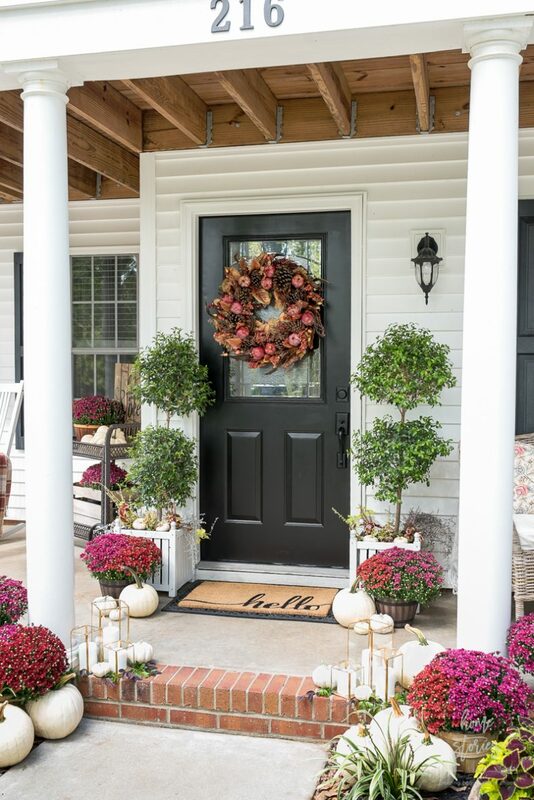 Next, I spotted the Better Homes & Gardens, 3qt Bicolor Purple/Red Mums and white pumpkins at my local Walmart and my color scheme was set! Aren’t they simply gorgeous?! I’ve never purchased bicolor mums before and I just love the interest they add. The mums come in a green branded Better Homes & Gardens label so they are easy to spot in the garden section of your store. You will need containers to place them in. I saved my mum containers over the years, so I just used what I already had on hand. A cute vintage crate on the drink cart is the perfect mum basket! 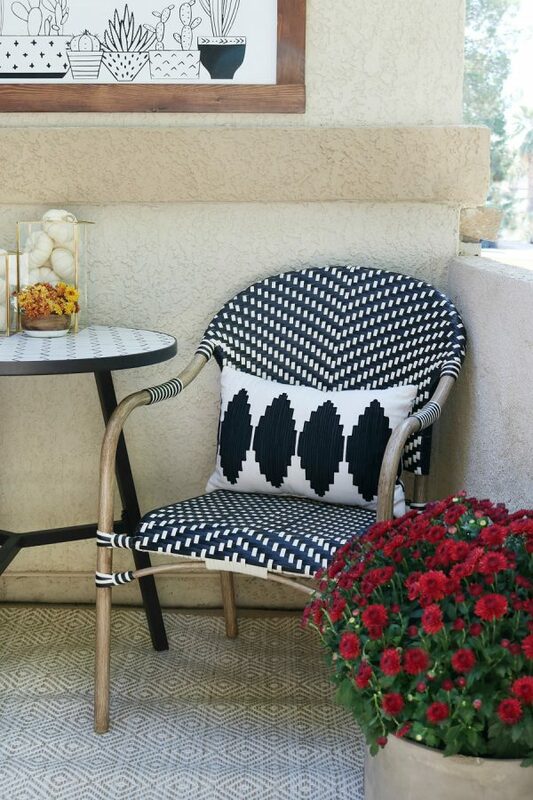 The only other new item that I purchased for the porch are the pillow covers made from napkins. I’ll share a quick tutorial later this week on how to create pillow covers in less than 10 minutes. 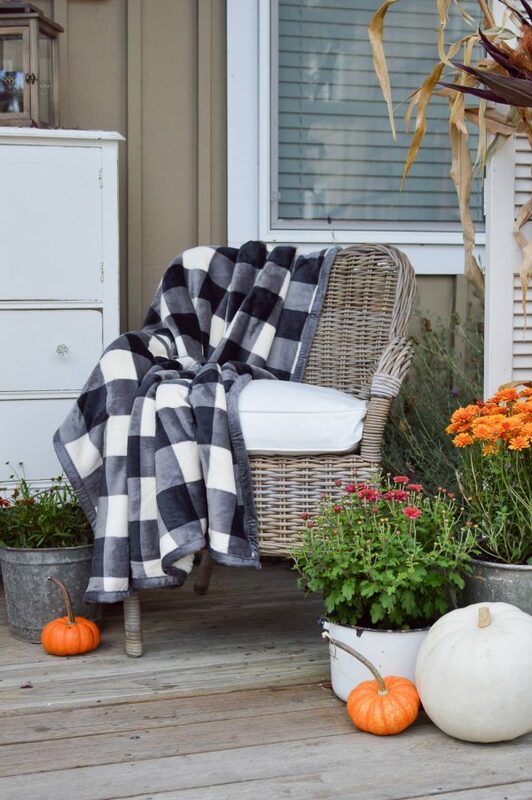 The cozy gray, tassel, herringbone throw is from Better Homes & Gardens at Walmart and is one of my favorite accessories. As I type this, it’s currently on sale for $9.23 but prices are subject to change. My Better Homes & Gardens Carter Hills Outdoor Serving Cart is currently on clearance so grab one before they are gone! I have had it outdoors since February and it’s handled the elements beautifully. The wheels roll smoothly, so it’s easy to move it around where needed. I was so happy to find a great selection of white pumpkins at my local Walmart this year! Usually I have to drive around for miles or paint my pumpkins to achieve the look I want. 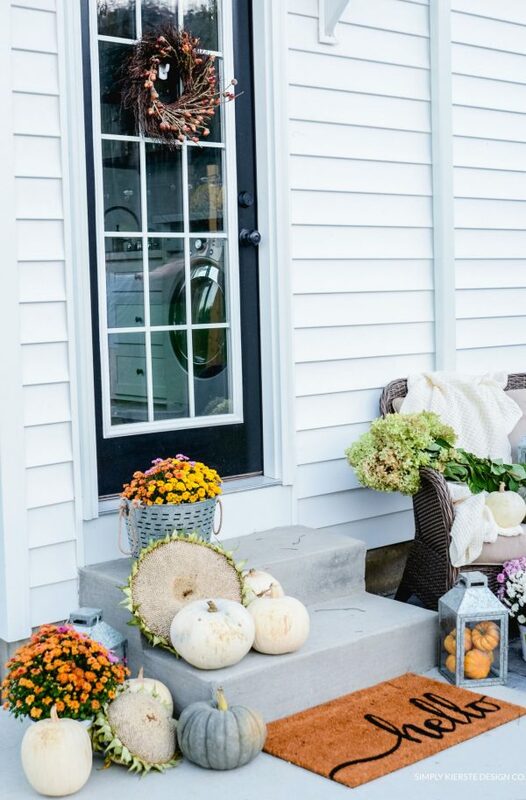 I have a great post on How to Paint Faux and Real Pumpkins in case you aren’t able to find the color you desire. You may have also noticed that I painted our front door! The electric blue from the previous owners was fun for the summer but wasn’t my taste. I love the classic black. 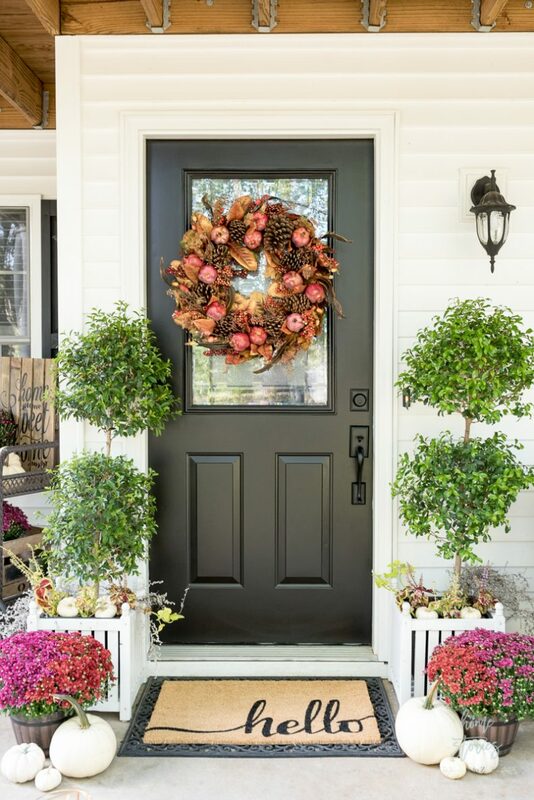 I’ll have a tutorial for you later this week on how to paint your exterior doors. 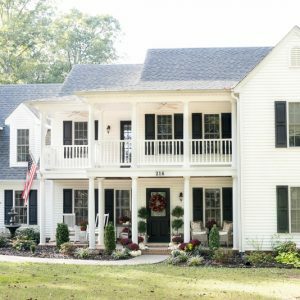 It’s a simple and inexpensive project you can do yourself in just a few hours that completely transforms your curb appeal! My topiaries were purchased from Walmart last spring and used to reside on our old back porch. I’m thrilled that I’ve been able to keep them alive this long! I planted some coleus around the base to update them for fall. 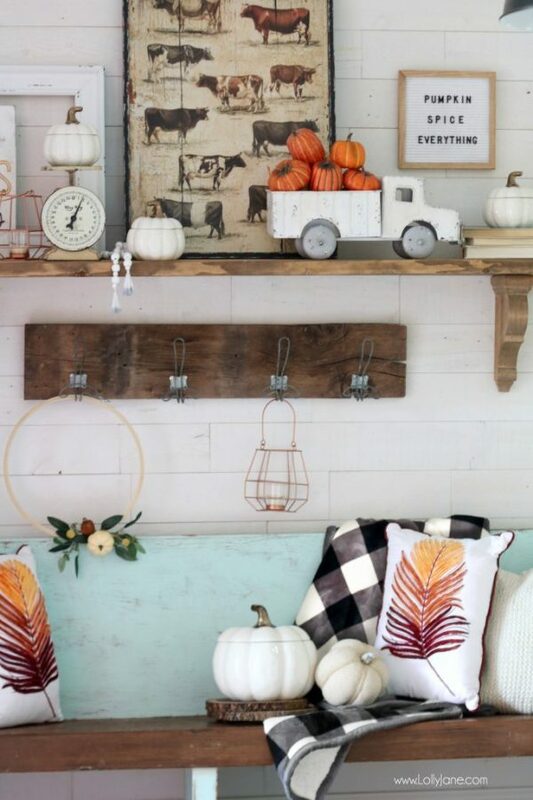 Thanks so much for stopping by and seeing this year’s fall porch! Feel free to pin this image and save it for inspiration! 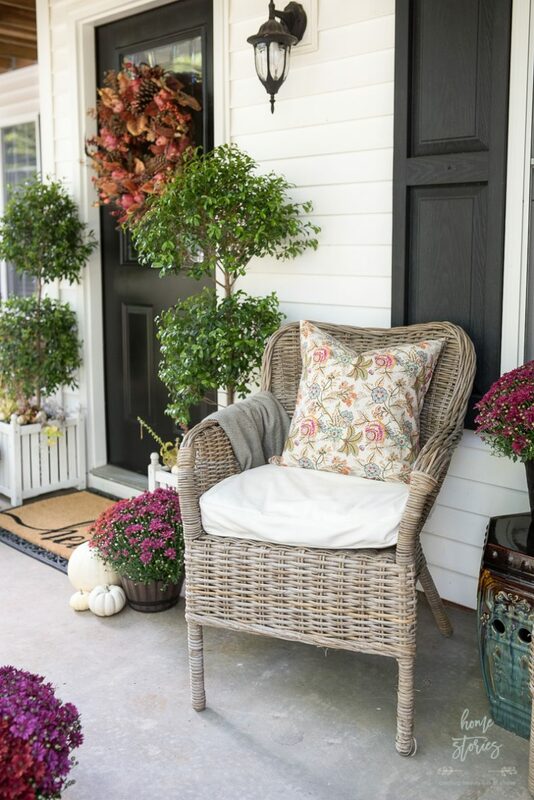 Here are all of the Better Homes & Gardens at Walmart product links used on my porch. Click the link to be taken to the product. Always so elegant! 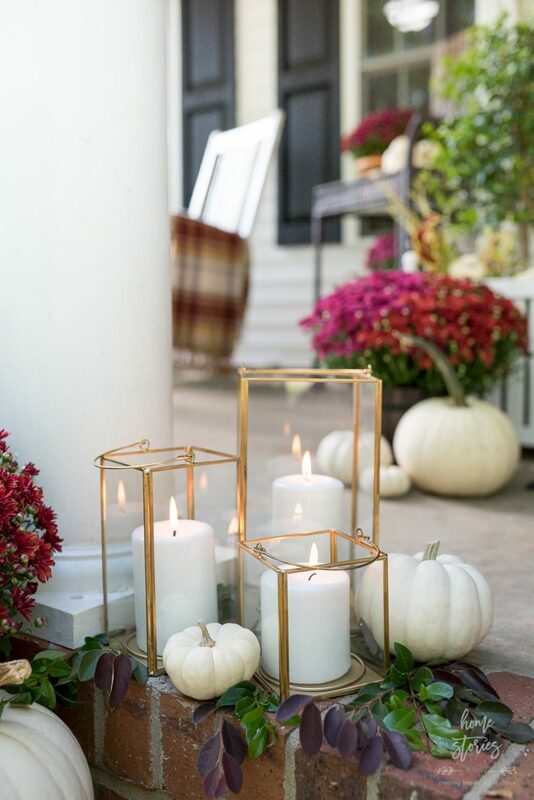 You got me at the white pumpkins and golden lanterns. AMAZING! gorgeous! love the greens. 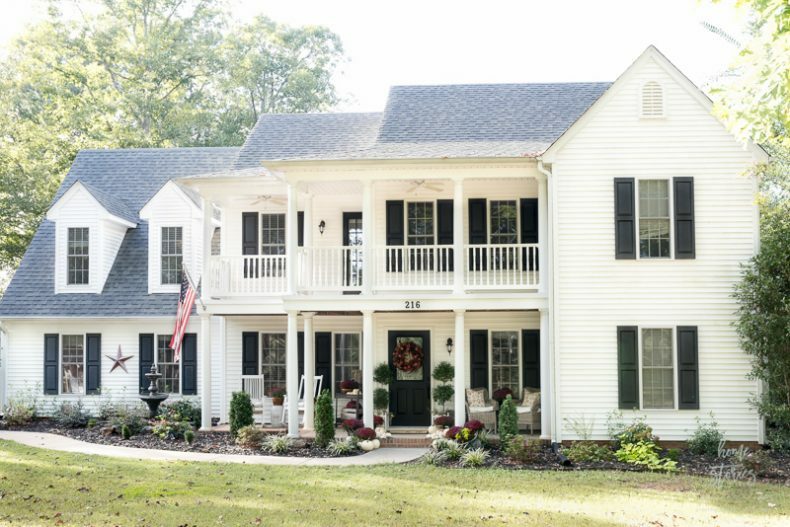 i don’t think i’ve seen your new home yet, so WOW! that’s certainly a much bigger space than your other home. 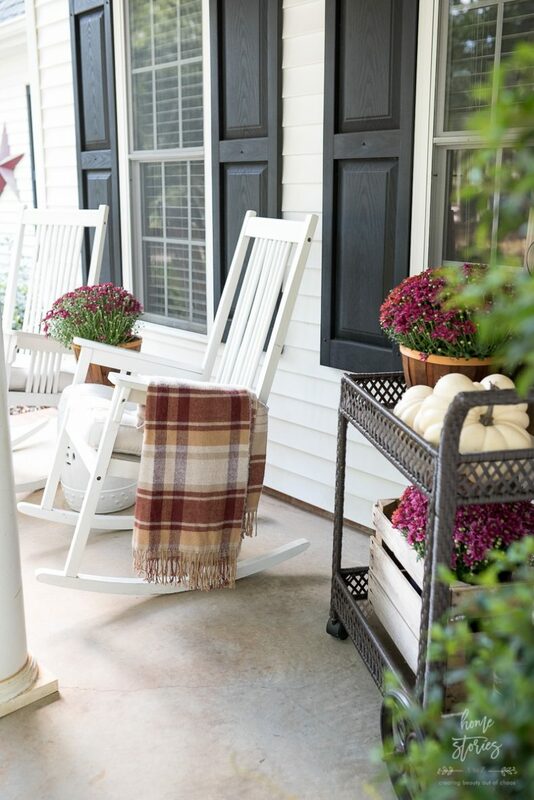 enjoy, and relax on that porch! 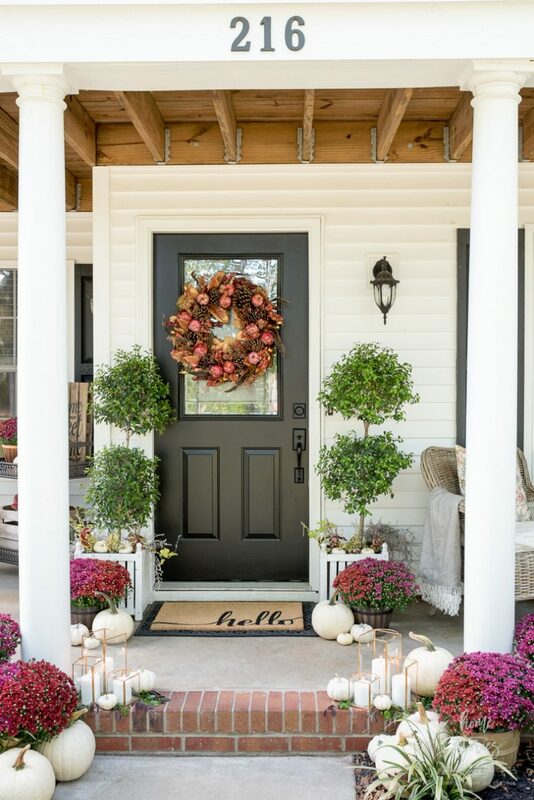 Gorgeous porch, love the fall colors and coziness of it. Where did you get your door mat? Just gorgeous! 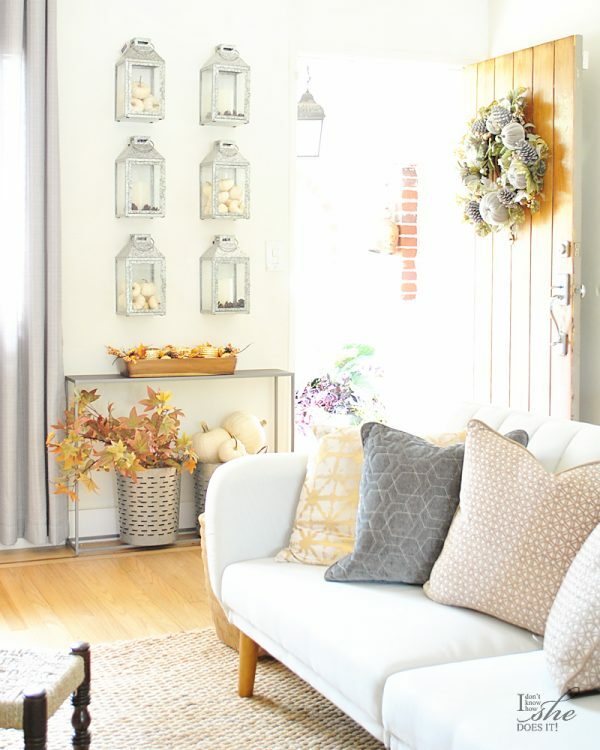 I love how your are turning your new house into your home one project at a time! 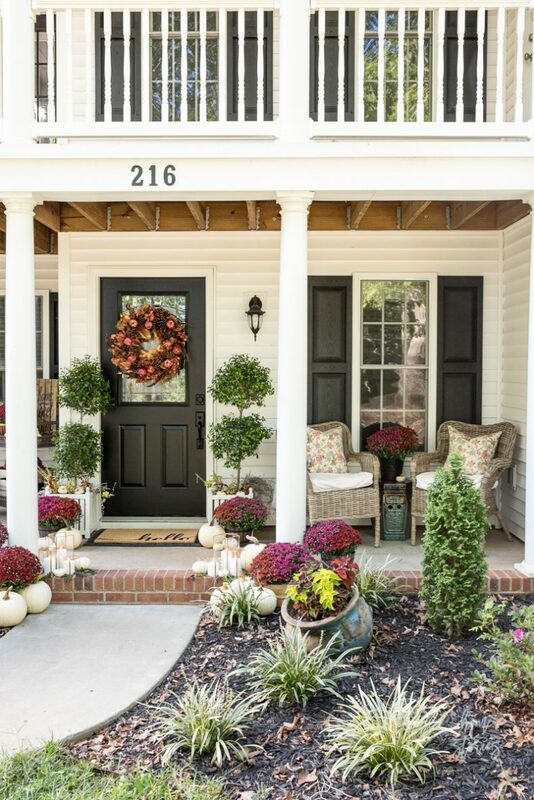 Smitten with the porch and new door color! OMG, what is there not to love. 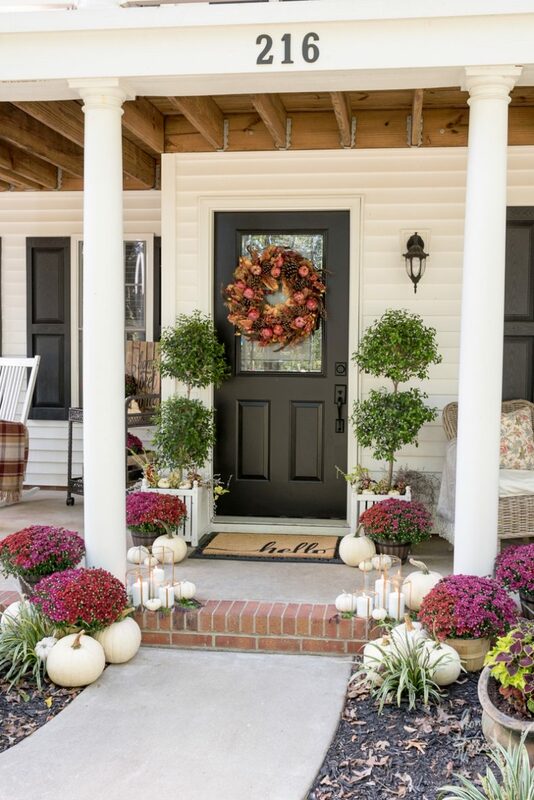 I would love to own a fall front porch like this breathtaking! 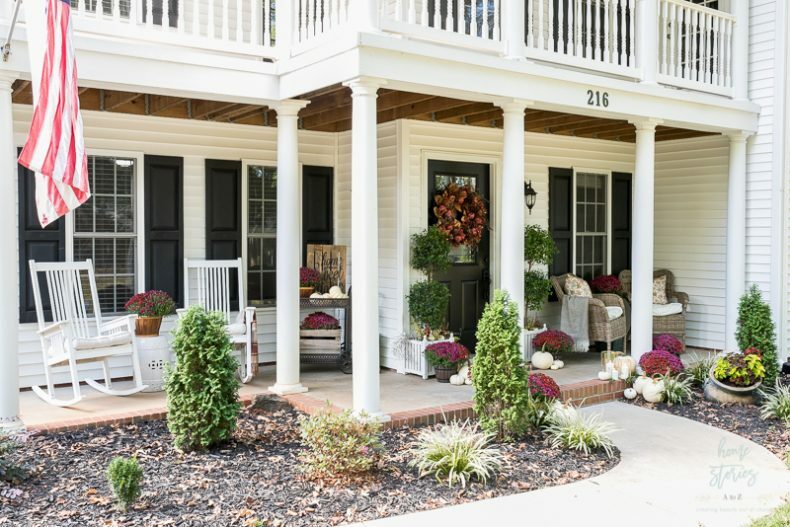 Beautiful porch. I like the colors you chose to use! 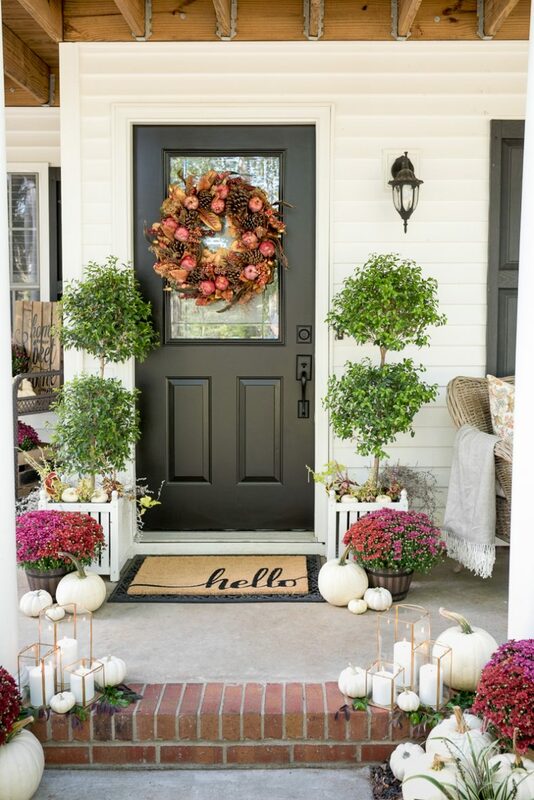 Did you buy your wreath for the door or did you make it? Its very beautiful too and goes so well with the mums. Thanks Connie! The wreath was purchased at Costco around 10 or so years ago. I’ve had it forever and dug it out of my wreath stash for this design. I agree, it goes well with the mums and it made me glad that I held onto it through the move!